Just out of curiosity, would any of you gurus happen to know exactly *why* we have the big split between CC in North American orchestra and BBb in Europe? The recent re-interest in BBb in N. American orchestra got me wondering. The fact that several people started cutting down BBb's to CC several decades ago would seem to prove that at one point, BBb's were pretty common in the orchestra scene here. What happened to turn the tide toward CC? Was there a trigger event of some kind, or was it an eventual conversion (because of change- of-taste in American orchestra repertoire perhaps)? Rotary BBb in Germany/Europe because it always has been. Piston CC in America because Chicago York. Let the postmortem equine beating begin! There shall be no postmortem equine beating! This post was NOT meant to discuss the merits of BBb vs. CC in orchestra. Rather, I'm interested in when / how the widespread use of CC in American orchestra (and the associated dogma) came into being. Ken, am I correct in assuming you're saying the CC-in- orchestra tradition started after the Chicago York came out? Wouldn't that mean that there was already a clear preference for CC at that point, resulting in production of that instrument? Or did everybody latch onto it after it was introduced because it was the first "true American" orchestral tuba?
' seems to me, either tuben in B and E or tuben in A and E would make the most sense. obreitys wrote: Rather, I'm interested in when / how the widespread use of CC in American orchestra (and the associated dogma) came into being. Because of Bill Bell and Arnold Jacobs. They were both "orchestra tuba titans" who held a lot of sway in the tuba community. Bill Bell and his students on King 4/4 rotary CC tubas, as well as Alex, Meinl and Mirafone rotary CC tubas; Arnold Jacobs & students on 6/4 York-a-phone piston CC tubas. I've always thought a tuba in "A" would make playing the "Ride of the Valkyries" really easy. Were Jacobs and Bell influenced by Helleburg's use of CC? obreitys wrote: There shall be no postmortem equine beating! Did you read the whole thread I posted? the elephant wrote: August Helleberg. Wow. Lots of interesting information. Thanks to everyone who's contributed so far! Around the same time, weren’t there C melody saxophones and “Preacher” trombones in C for reading out of the hymnal? Maybe we were the only ones to see a benefit from what was a fad for everyone else? I seem to remember reading a story of Bill Bell getting a Cerveny CC before his Cincinnati audition and figuring out the fingerings right before the audition because “you play a CC in orchestra” and he had played BBb in the Sousa Band. Twin cam I-6 vs V8. Three Valves wrote: Twin cam I-6 vs V8. I believe that in the US, the switch to CC tubas was done for largely the same reasons that it was done with trumpets, but it happened with trumpets first. Georges Mager, who was principle trumpet at the Boston Symphony from 1919 to 1950, was the first principal player to adopt instruments in C as the primary instrument. (This largely pre-dates Bill Bell and Arnold Jacobs). Mager's students included Adolf Herseth, Roger Voisin and Bernard Adelstein - each of whom was hugely influential in the symphonic world, at least on this side of the Atlantic. obreitys wrote: Just out of curiosity, would any of you gurus happen to know exactly *why* we have the big split between CC in North American orchestra and BBb in Europe? It is really only in Eastern Europe where the BBb is mostly used in the orchestra. In Russia BBb is the main orchestral tuba. In much of Europe F is the main orchestral tuba, with CC used as contrabass. In Germany it is F and BBb. In the UK it is today mostly Eb and CC - but up until 1960’s it was F tubas. It is interesting the regional differences even today. 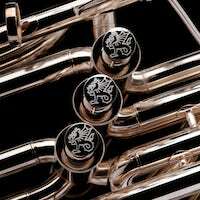 hup_d_dup wrote: I believe that in the US, the switch to CC tubas was done for largely the same reasons that it was done with trumpets, but it happened with trumpets first. Georges Mager, who was principle trumpet at the Boston Symphony from 1919 to 1950, was the first principal player to adopt instruments in C as the primary instrument. (This largely pre-dates Bill Bell and Arnold Jacobs). Mager's students included Adolf Herseth, Roger Voisin and Bernard Adelstein - each of whom was hugely influential in the symphonic world, at least on this side of the Atlantic. Thanks Hup. Your post reminds me of a pleasant experience I had in 1953 when I attended a concert of the touring Boston Symphony performing in the cavernous Shrine Auditorium in Los Angeles. As I approached the ticket office I encountered a trumpet player standing around chatting with arriving concertgoers. Friendly guy. He was asked about his beautiful instrument and he identified it as a Courtois C trumpet. Said these had been standard in the orchestra for many years. By the way, the great Roger Voisin was playing principal trumpet that evening.